Boone is a real beauty. 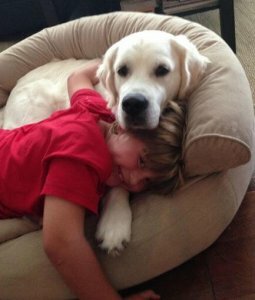 This loving and intelligent English Cream Golden Retriever was born and raised here at Goldwynns and now lives with Catie and her family in Florida, where he is capturing hearts as you read this. This is Boone’s official fan page, so be sure and bookmark it so that you can drop back and see new photos and updates on him as we receive them. Oh the joy your boy from GoldWynn Retrievers has brought us!! Boone came to us as a 9 ½ week old puppy full of life and love. We are a dog family of three with a six year old son and Boone has not only won over our entire family but everyone he meets as well. Someone stopped me one day while taking our son to school and after sitting on the ground with him said, “Boy, is he special! !”…and that is exactly what Boone is, special! He is charming, fully, smart as can be, and extraordinarily lovable! I attribute that to not only his quality breeding but from the attention and love that he received from Karen and Roger since birth. I knew that they were exceptional folks after recognizing that Karen was the only breeder of Crème Golden’s that asked me about our life and what our puppy’s world would look like. They truly care about their dogs and it is reflected in the pups personality from day one. As for the love affair that our son and Boone have…that has brought me the greatest joy!! It was as if Boone knew from the beginning that that was his boy. They are thick as thieves and couldn’t have a better buddy in the world then each other. We are so thankful to have this sweet puppy in our lives. He makes us smile and laugh and so very happy every day!